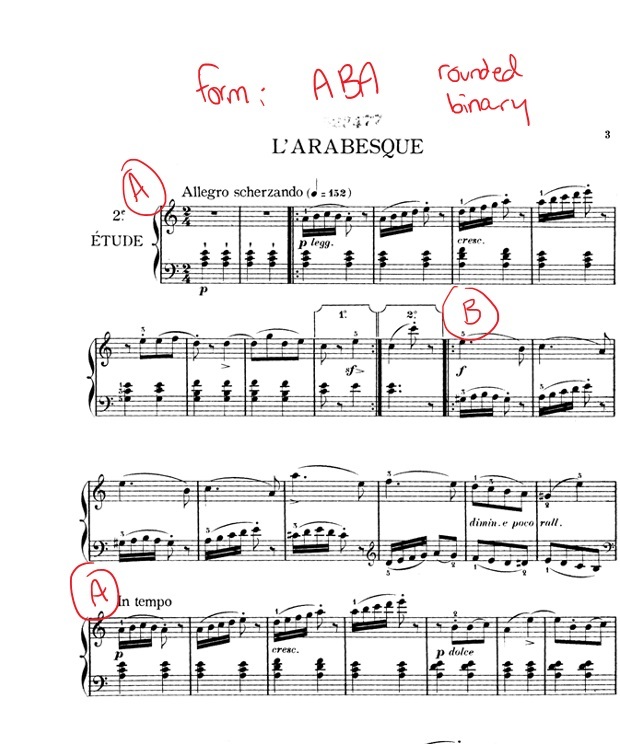 Today we’re going to have a look at Arabesque by Burgmuller, which is a grade 3 level etude (early intermediate). 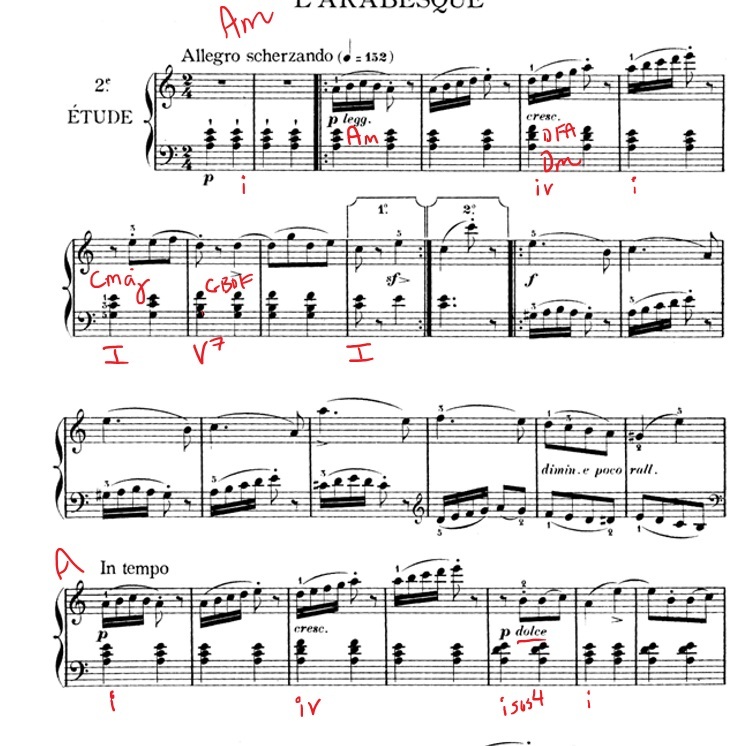 Since it’s an etude/study, it’s great for developing finger coordination for fast passages. Aside from that, it’s one of the most well-known grade 3 piano pieces, and I consider it mandatory repertoire for my students – both because they tend to love it, and it’s fun to play. In this episode, we’ll talk a little bit about the history of this piece, do a play-through, and then dissect it so that you can get a handle on practicing it. Arabesque is the second of 25 etudes in Burgmuller’s op. 100 collection titled “25 Études faciles et progressives”. Visit this page if you’d like to download the sheet music. Burgmuller was a German pianist and composer who was active in the Romantic era (1800s). Though he was born in Germany, he spent most of his adult life living in Paris, and his music tends to reflect the light salon style of the time. Though Burgmuller wrote various piano music and even a couple ballets, he’s most known for his etudes for children. Of course, you don’t need to be a child to enjoy his etudes, and I strongly encourage you to check out this collection of 25 etudes, as they’re great for the intermediate student who wants to develop their technique. Without further ado, let’s play through this fun piece! There’s a lot to decode in this little piece, so let’s get started. First of all, what’s the key signature? No sharps and flats, which tells us one of two things: it’s in the key of C major, or it’s sister key, A minor. A basic assessment of the starting chord, and ending chord, shows us that we’re firmly rooted in a minor key. This translates to fast (allegro) and playful (scherzando). We also have a marking at the very beginning abbreviated to legg., which is short for leggiero. This means to play lightly. Part of the “study aspect of this piece is apparent right away, just from looking at these three terms. We have to play fast (and this is no small feat, seeing as there are 16th notes everywhere). But we also have to play “playfully” and “light”, which takes some extra effort when you’re playing fast. The tendency with fast playing is to stiffen up the fingers, which ends up making the playing sound heavy and clunky. It takes some effort and concentration to get a light sound that doesn’t end up sloppy. Further adding to the difficulty is that we also must start quietly – another challenge when we’re working on fast fingers. Playing quietly and fast requires much more control than playing fast and loud. Let’s hunt down some more terms and symbols. In two parts of this piece, we have a “1” and “2” section. This means “first ending” and “second ending”. So when we play the part through the first time, we play the section that is labeled with a “1”. On the repeat, we skip that “1” and jump to the 2nd ending. There are several accent and staccato markings in this piece. First, we have the staccatissimos, which are the funny little reverse water droplets you see over the chords. These are like super staccatos, and need to be very light and dramatic. Then we have some regular staccatos, usually placed at the end of a short phrase. We have a sforzando (basically the same thing as an accent), and some regular accents as well. Don’t ignore these markings! It’s one thing to read the notes properly, but obeying these symbols is what really gives this piece flair. Here’s how I would play the staccatissimos – very dramatic, but be careful about pressing too hard. The tendency with extreme staccatos is to dig into the keys, when really what we need to do is a quick releasing motion, not an attacking motion. With the staccatos at the end of each phrase, just make sure you’re getting a nice and light lift at the end of each set, and that you’re not lingering on the last note. So what’s the form of this piece? How many parts are there? It’s pretty easy to tell as long as you can follow the repeats. So we have our starting section (the main tune). Where does that tune change into something quite different? After the 2nd ending. That’s when the chord pattern changes, and the left hand takes on the role of playing the fast parts. We’ll label these sections “A” and “B”. Are there any new parts? Nope, not really – but we do have a return to the “A” section further down, which means we would call this form “rounded binary”. That basically just means there are two parts, but it finishes with the first part like so: ABA. So now let’s take a look at the chord patterns in this piece, as it features solid chords throughout. So we’re alternating between i (the tonic chord of Am) and iv (the fourth chord of Dm). I (C) – V7 (G7) – I (C). This brief leap to a major key never occurs in the second A section – instead, we have some Amsus4 chords that alternate with regular Am chords, creating a really somber vibe. Though we don’t have solid chords in the B section, there are still implied chords. If we rearrange these, we get an E major chord. That would be the fifth chord of our A minor key, which we’d label like this – V.
In the second bar, the strong beats feature the notes A-C-E – back to our tonic chord, Am. So the B section simply alternates from the dominant to the tonic (V-i). We do have an interesting switch to an A major chord down the line (C# E A), which serves to add interest and help us transition back into the A section. The 16th note sections are tough in the right hand, but they’re even tougher in the left hand. Because of this, it can be useful to start learning this part by blocking the notes (playing a solid chord). This gets your fingers used to the position changes without having to also move fast. When learning to play fast, be patient. Start slow, and really master slow playing. Make sure your notes are clear and concise. Then, speed up to a moderate speed. Don’t speed up until you can play very well at whatever speed you’re playing. It might take you a few weeks to get this fully up to speed, so please don’t despair your early attempts. More than anything, it’s really important to put the emphasis on evenness. Don’t play fast at the expense of good technique (aka “mushy fingers”). Keep it as slow as you need to in order to have good control over your fingers. Another area that will require special focus is the transition from the B section back to the A section. This finger pattern is tough, and I recommend lots of slow drilling – even memorization – to help you through this sticky spot. Nothing is worse than an overall excellent performance of this piece, with a fumbled and sloppy transition! One thing that helps somewhat with this transition is the marking “dimin. e poco rall.” This translates to “get quieter and a little slower”. 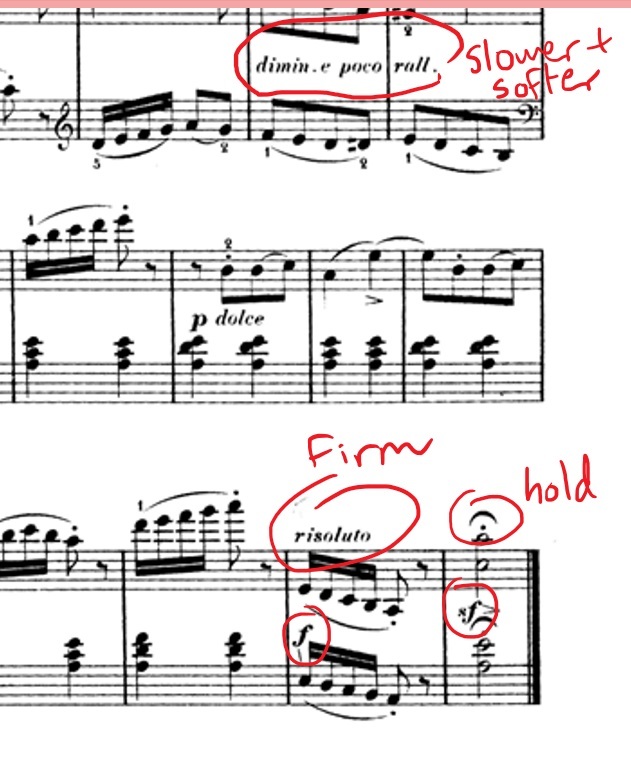 To contrast the very light playing throughout, we have a tiny section marked “dolce”, which means “sweetly”. Play this as beautifully as you can, since it gives us a lovely contrast to the energy of the rest of the piece. Finally, we finish with the marking risoluto – firm and decisive. There’s no wishy-washy ending to be found here! This piece ends with a bang, also evident by the forte and sforzando. And to contrast all of those phrase-ending staccatos, our last note lands on a fermata – this time, we linger on the note a little longer than directed (2 beats in this case). 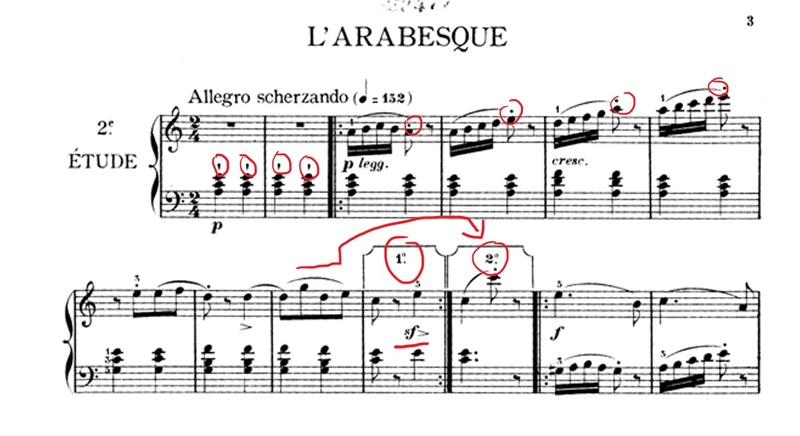 One final note before I send you off with this piece is to check out some other arabesques. These pieces are usually very fast, and a little ethnic-sounding. Though it should be noted that these pieces aren’t actually fashioned after Arabic music – just what Europeans at the time assumed Arabic music was like. 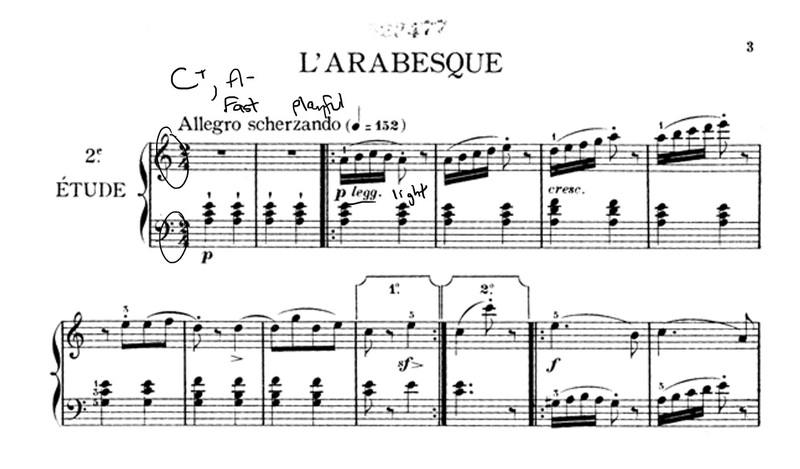 Claude Debussy composed Deux Arabesques, which are very famous examples of the genre (and very beautiful).